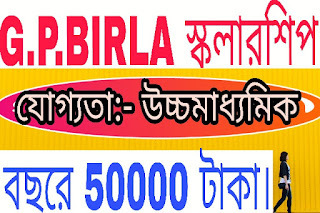 Trust proposes to grant Scholarships to meritorious students, male or female, from West Bengal, who have in the year 2018, passed class XII examination and have secured 80% marks or more from State Board or 85% or more from Central Board and are in need of financial help to pursue further studies.Scholarship amount will be to cover Tuition Fees and Hostel Fees, [where applicable], subject to a ceiling of Rs. 50,000/- per student per year. The Trust has been established to carry forward the cherished dream of Late Shri G. P. Birla, the renowned Industrialist and Philanthropist, to promote education, develop human resources and empower the youth of the Country. With this objective, the Trust proposes to grant Scholarships to meritorious students, male or female, from West Bengal, who have in the year 2018, passed class XII examination and have secured 80% marks or more from State Board or 85% or more from Central Board and are in need of financial help to pursue further studies. “G.P. 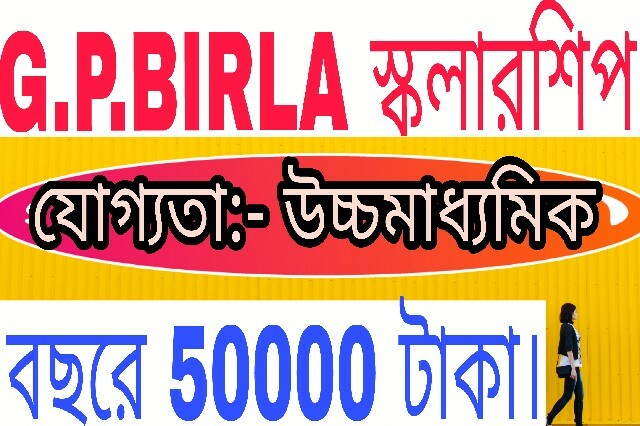 Birla Educational Foundation, 78, Syed Amir Ali, Avenue, Kolkata - 700019”. 1. A completed copy of the application form attested by the Head of the Institution from which the Student has passed Class XII or where he has taken admission. 2. Proof of admission (if admission has been taken) at a university or college in which the applicant shall pursue higher studies. 3. Copy of academic certificates and grade reports for the last examination. 4. Copy of other certificates for extracurricular achievements. ii. Copy of Income Tax Return or Certificate from Tahsildars or Councillors, in any other case.